My Boston Marathon training is officially tapering off, and the race is just one week away! Everything feels great, taper madness has not set in, and I just need to power through a likely-to-be-stressful work week before flying out to Boston next weekend. 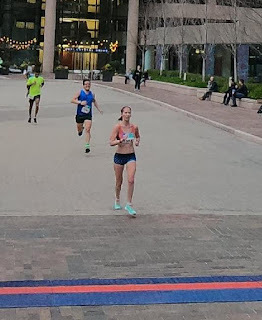 For my last hard workout, I decided to run the Crystal City 5K Friday last Friday night. I've run this race many times in the past, including last year. The weather is never great for this race and I'm typically exhausted on Friday evenings, but the race has such a fun vibe that I can't resist it. Friday was probably one of the most mentally exhausting days I've had since I started my job a year and a half ago. I won't get into the details here, but suffice it to say I would have rather gone home to a bottle of wine rather than a windy 5K, but I was already committed. Sub-20 is an eventual goal of mine for the 5K, but I wasn't necessarily going for it on Friday. I wasn't overly excited about the race and for some reason didn't think a PR was in the cards either. My plan was to run a somewhat conservative start so I would have enough energy for the final mile (directly into the headwind) and hopefully get a course PR. Before the race, I ran into my friend Hannah. We had no idea that each other were running the race so it was a pleasant surprise. I had already warmed up and with just 5 minutes until the 6:30 start we lined up. But then they announced that the race would be delayed to 6:35. And then 6:40. I can only guess this was due to the long line at packet pickup. Normally this would have annoyed me because of how I timed my warmup, but since it was 70 degrees, I didn't feel like my legs were getting cool or stiff just standing around. Plus, I had Hannah to chat with and the time passed quickly. time. I saw Greg and my friend Allison just before mile marker one, which motivated me to pass a guy who otherwise would have photo bombed the picture Greg was taking of me! I knew from experience that this mile was slightly downhill, and that there was also a tailwind. I cruised along at a hard effort, but I still didn't feel like I was at my max. I would be saving that for the last mile. There were a few turns in this mile as well, but they didn't bother me as much as they did last year. Aside from a dry mouth, everything felt great. Yeah, I was shocked at that too! I was totally ready to push really hard during this last mile and I knew to expect uphill headwind. I increased my effort level, but my Garmin was reading in the low 7's. Yikes. I tried to up the effort another notch, but I couldn't. All of a sudden everything was so hard and I felt like I didn't have any "fight" in me. I was tired and mentally drained and there wasn't much motivation or drive to make myself hurt. I think this is a general weakness of mine with the 5K-- an inability to make myself feel that level of hurt. I can tolerate a lower level of pain for a long time, but I haven't figured out how to really dial in that hard effort and tell myself it's just for one last mile. So, even though I felt like I had saved up for that last mile, I didn't have what I needed to close it out strong. I crossed the finish line in 20:47, which was unfortunately not even a course PR. I tried really hard not to get down about this, since I am in much better shape now than I was last year. But Greg reminded me that last year I was training specifically for the 5K. And it wasn't as windy last year. run on almost any morning this cycle. 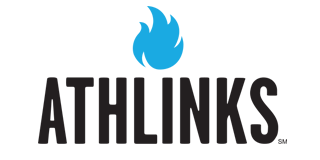 For example, just two weeks ago I ran a four-mile tempo at a pace of 6:48, and followed that up with hill sprints and then another 4-mile tempo! 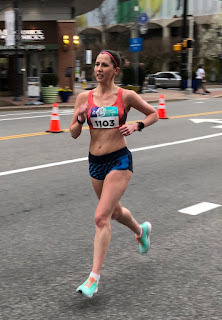 So it was a little frustrating to not be able to go much faster in this (shorter-than-4-mile) race, but I'm not discouraged. My key takeaway is that I simply didn't have the mental energy to make myself push harder through that wind. I didn't have a fight in me, but that's not surprising given that I had already put in a stressful day at work. I should also note that my official time is 20:51. Last year, the system didn't register my chip time, only my gun time and it looks like the same thing happened here. Last year I ran a PR so I investigated it and they adjusted my official time. This year, I don't care enough to contact them about it. It's just a 5K on my way to Boston! In any event, I was the 6th female in a competitive field, and last year I was 7th. So I'll take it! I would have had to run over 30 seconds faster to come close to the 5th female, so it's not like I was neck-and-neck with anyone. Maybe a little more competition would have helped, or it could have just made me feel more dejected- ha! The next day, I ran my easy run (70 minutes) at a surprisingly zippy pace-- 8:17. I was truly trying to run my typical easy pace which is around 8:30 but my legs felt peppy and every time I looked down at my watch, my pace was faster than expected. I think this shows that I recovered well from the 5K and that things are starting to come together. This week my top priorities are not getting sick, and not letting work stress impact my sleep. I will leave work at work and not think about it once I am out of the office. I also have to finalize my packing. I still am not 100% sure what I am going to wear during the marathon which is very unlike me. 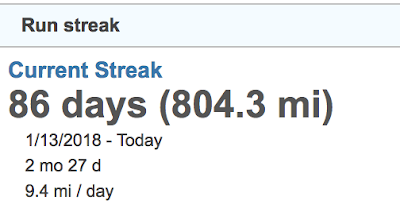 My training cycle was very intense, averaging in the low 70's per week and maxing out at 78.5 miles two weeks out. As such, my coach has given me a really nice taper for the coming week. I'm most looking forward not having to coordinate logistics around the weather and trying to get into work on time. I'll have a lot of mental energy to apply toward my job so that when I leave each day I will be confident that I gave it 100%. I will be doing two book signings on Sunday, April 15 for anyone who'd like to meet me. You can purchase a copy of Boston Bound on site, or I will sign a copy you already have. The lobby of the Ritz Carlton on Avery St. from 11:00am-noon. This is near Boston Common. The ShowPlace ICON from 5:30-6:30pm. This coincides with a showing of the Boston documentary. The address is 60 Seaport Blvd, near the Expo. You can still get tickets for the 6:30pm showing here. My primary race goal is to NOT regret my starting pace. I do not want a repeat of 2016 when I bonked and was miserable for the last 7 miles. I want to enjoy the entire race and feel strong throughout. My "A" goal for finish time is 3:16-3:17, but I would be elated with a PR of any kind. I'm in Wave 2, which starts at 10:25, so feel free to track me on Marathon Monday! No days off this cycle! Sounds like your head (and your legs) are in the right place!!! Good luck at Boston! You've had a huge training cycle, with a ton of miles and some very intense workouts. Can't wait to see your Boston performance! so fun that you are doing book signings!!! 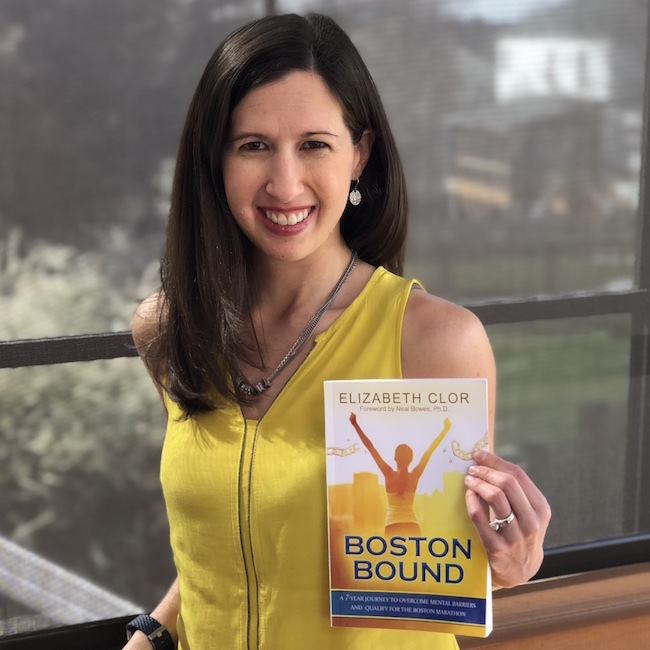 I wish I was running Boston this year so I could get my copy signed! Hey Elizabeth, I met you and Greg on the Alaskan cruise and it's been fun watching your insane training :). Wishing you all the best on race day! Just finished reading your book! Love cheering you on in the book and look forward to cheering you on tomorrow! 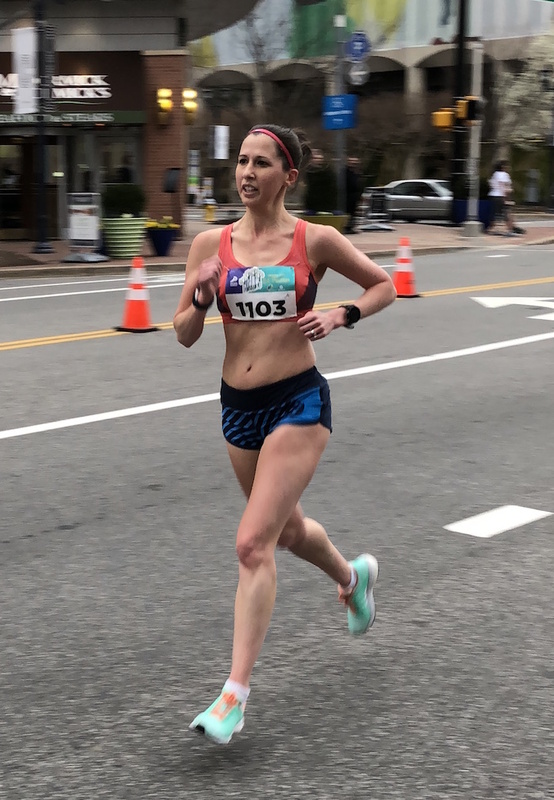 I've been following your blog for a few weeks leading up to a race last Sunday (which was a disaster) and since the race quite a few of your race reports are giving me some insight into what went wrong because I've been at a loss. I'm in the best shape of my life, everything training and taper wise was perfect. And then less than halfway into the race something didn't feel right....and it got worse. And worse. I had to lie down with 6km to go but somehow got up and got to the finish line. I just checked your Boston Marathon result - hard to know before reading your report how you'll feel but given what I've heard about the conditions that looks like a fantastic result, and probably a PR effort in better conditions which is obviously frustrating but not in your control.